I saw "Apollo 11" a few weeks after its opening. Several friends described it as not to be missed. "Apollo 11" celebrates the 1969 moon voyage and landing with new footage from NASA & the National Archives. Assembled in linear style, we follow the preparations, countdown, voyage, moon landing and return. The result is eye-popping and jaw-dropping. Seen 50 years after the event, "Apollo 11" quietly reminds us of an amazing accomplishment, one that feels less possible today. Like "First Man," "Apollo 11" inspires. 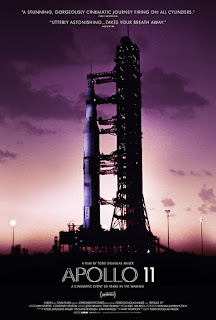 "Apollo 11," 3½ stars, rated "G." Does it deliver what it promises? Amazing footage of an amazing feat. Is it entertaining? Awesome. Is it worth the price of admission? A must-see.